The Adventures of Cassie: Travels and Things.. I dyed up these nice blue skeins of yarn that were unraveled from a sweater the other day, and now I'm trying to find a pattern for them. I'm thinking of a shrug or cardi of some sort, but haven't decided yet. It is super soft (merino/angora/rayon blend) and lightweight. There's about 850 yards of it, so I've got a bit to work with. I'm also making progress on my scarf, but that was thwarted when one of my knitting needles mysteriously vanished from the face of the planet. I don't know how I always manage to lose my nice bamboo knitting needles, but I do.. Even though I haven't been working this summer, I still feel like I've been keeping super busy. 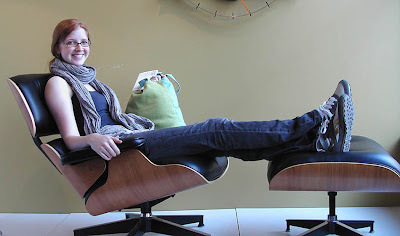 In the last few weeks we went to Chicago (to see Josh Ritter with Nate's family) and then to Milwaukee to see John Mayer at Summerfest, shop in the Third Ward, eat lots o' good food, and visit the Grandma & Grandpa C. Here is a shot that Nate's Dad took of me kicking my feet back in an Eames chair at a swanky furniture shop in the Third Ward. 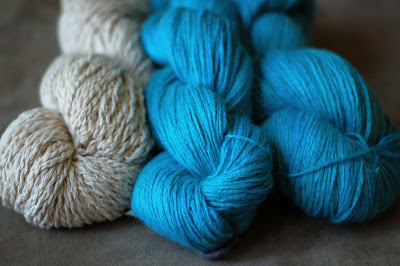 wow, that yarn that you spun up sure is gorgeous! 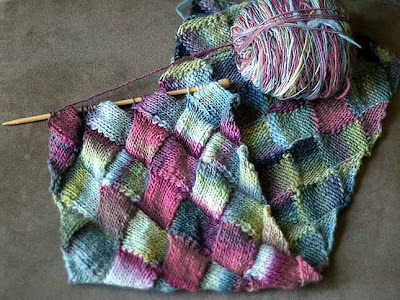 It looks SO lovely in that entrelac scarf pattern.